Over time, the beautiful ladies and gorgeous girls have filled my inbox (timeline and page and blog) with their relationship problems. Some of them are so obsessed with their guys that they simply overlook his mistakes, even if they’re a crime in someone else’s eyes (like mine!). I don’t encourage two-time (what we call double-dating), three-time (triple-dating? ), four time (group-dating) or n-time (when a guy is in a relationship with all the girls down the street!). If you’re in relationship and committed, there seems no reason to look for love outside, and if you’re doing it (even if you’re doing it subconsciously), there’s no need to continue your existing relationship. Cheating is just out of the question – immoral! So many girls ask me what an ‘ideal’ guy should be like? Should he look like Ranbir Kapoor or Shah Rukh Khan or Brad Pitt? Should he be smart like Sheldon Cooper or funny like Barney Stinson? What is the definition of a ‘perfect’ guy? Should we go after TV commercials or Sitcoms to find the kind of guy one should have? The answer to all this is – NO. An ideal guy is always around you, you just pin-point jerks and regret! Oh my God, I’ve got a variety of guys in front of me as choices, but then, whom should I go for? This one confusion makes girls enter the ‘trial’ mode where they come into a relationship with anyone (ANYONE!) and then regret later. Just because all your friends have got boyfriends, and all your friends are celebrating valentine’s day by exchanging red roses and chocolates, doesn’t means your life is over! Stop coming into relationships just because you want a ‘tag’ of being into one. This is the biggest mistake girls are making and believe me, being a girl myself, it’s hard for me to write all this up! The guy you are finding for yourself should be perfect, isn’t it? That’s the reason they’re called ‘soul’-mates. They’re not room-mates, or bed-mates, or facebook-mates, but ‘soul’-mates and there are so many things you should think about, before saying that legendary ‘YES’ to almost anyone! The guy you’re dating (or are friends with), is he a good listener? This is a very important point you should keep in mind because guys, who can’t pay attention to you now, won’t think about you even once before breaking up (if such a situation comes!). Does your guy respects you or insults you in front of his friends? If he’s the latter one, you shouldn’t think twice before breaking up, you’re in a wrong place, girl! Does your guy support you when you’re emotionally down or he’s there only to have fun and party? If he’s supporting you and listening to you, don’t ever let him go, but if he’s the latter kind, then you know what to do. Life isn’t all about fun and parties, you need emotional and mental support sometimes, and if the guy can’t support you, what’s the meaning of his presence? Is your guy asking you to cut contacts with the boys or male-friends you have? Is he dominating or over-possessive? Some girls complain that their guy asked them to cut contacts with their friends, and they did, and after their breakup, they’re all alone. Now, it’s not anyone else’s fault, but yours. You are the sole decision-maker of your life and you chose your friends, not your guy. Who is he to ask you to cut contacts? If you can discuss this thing with him, and ask him the reason, because maybe he’s not in good terms with one of your friends, or maybe he thinks that a certain friend of yours is flirting with you, discuss things, talk about them, sort it all out! But if he’s forcing you to cut contacts with everyone unnecessarily, it signals a ‘bad’ time lingering around! First and foremost thing that you should learn, while being into a relationship is, the fact that your guy is also a ‘human’ and no saint. He’s not the rightest person on this earth that you support him in whatever he does. Secondly, have a background check on the guy before you start a relationship. Know about his past, ‘not’ from him, but from his friends, the common friends you have and other sources like his facebook-profile and other social networking websites, they reveal a lot about a person! Thirdly, never grant a complete freedom to your guy, I don’t say you become a spy and stalk him, and suffocate his life, but there are smarter ways to do it, like you ‘stop’ asking him where is he going, or whom is he talking to. You stop spying on him, or stalking him for a day and notice the difference. If he comes to you himself, and tells you about his whereabouts, then it means you’ve got a nice boyfriend, and if he continues hiding stuff, that’s a red-alert sign of something wrong going on (possibly, not definitely!). Fourthly, always be frank to your partner, frank enough that he never has to think twice to come to you and share his problem. He thinks of you as his bathroom mirror, where he can confess anything and everything, be that mirror for your partner! Fifth and a very important point – never restrict him, guys ‘hate’ restrictions. They’re free birds, let them breathe in free air, believe me, they’ll love you more than anything. Once in a while, cook something for your guy! It’s nice if you’re having a lot of dates in posh restaurants, but sometimes a simple date can do wonders. Sixth and especially important for the girls who are either on their period, or PMSing, making guys think that females are ‘devils’ when on their period, it’s NOT so. Always be clear with your partner, and never leave ‘hints’ and ‘signs’. Guys hate the ‘decoding’ process that girls usually want them to do. Don’t keep hints, always be clear and there won’t be any fight between you! The key to a perfect relationship is within you, and the way you behave. It’s not a rocket-science to have a perfect, happy and loving relationship, rather it’s utterly simple. Like excess of salt or sugar can spoil a dish, similarly, excess of restrictions and freedom, both are harmful. Keep things balanced for a healthy and tasty relationship! Keep loving, keep fighting (in a healthy way, don’t break each other’s heads!). Sometimes, people get pissed from a relationship, or sometimes they’re cheating behind your back, reasons can be many. There have been multiple cases where a guy/girl broke up with their respective partners ‘without’ any reason. It’s not justified, as there has to be a reason for a relationship to break, but sometimes they’re not courageous enough to admit the real reason on your face, and to hide the guilt, they say – it’s not working anymore. Don’t worry, be positive! It’s not the end of the world, there is an entire life ahead, and it’s never too late to find your true ‘soul’ mate 🙂 There will be a lot of people you meet in future, you just need to know who is actually worth it and who deserves you the best. Remember, it’s the darkest before the dawn breaks, so if you’re feeling dark inside, light is nearby 🙂 All the best and good luck for your life! fAb work!! 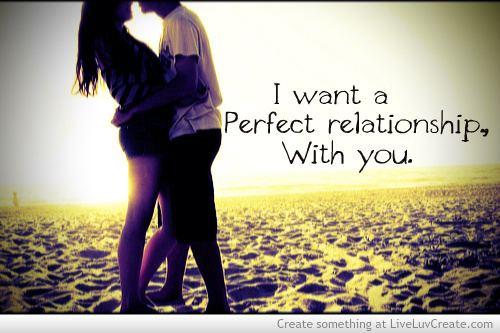 in aCtual dr iz no perfect definitn to define a perfect guy or relationship..!! Thanks Jaya 🙂 Stay in touch! Thanks a lot, Rahul 🙂 I feel glad you could connect! you loose your importance in their life. .
No, I don’t think it’s true at all. If the other person truly respects you, you won’t ever lose your importance in his life, but if the person never did respect you, you can’t win him over, no matter how much ever importance you shower upon him. It all depends upon the bond you share with the other person, and how much the other person respects and adores you. yes u r right. .
agree with you thank you so much..
u have given me..best thought. This was great 🙂 nd m eagerly waiting for something on LDRs. Plz write something soon…! what an article!!! i am your biggest fan now Mehak.